Located in Natural Bridge Station, Virginia, the Stonebridge Center sits on 16 acres with a stunning backdrop of the majestic Blue Ridge mountains. Options abound here, including multiple meeting rooms, a full stage, an industrial kitchen with a dedicated catering manager, ample parking, scenic outdoors, athletic fields and the beautiful James River, which borders the property. Planning a Wedding? 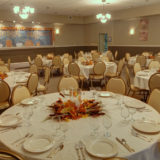 Along with our other amenities, we offer couples complete bridal party changing areas, and smaller, intimate spaces for rehearsal dinners, bridesmaid luncheons and post-wedding brunches.